Sherlock series 3? So Mainstream. What we're really talking about is Sherlock series 4. Because some chap named Benedict Cumberbatch deems it so. "We've agreed to two more series but I could get into trouble for saying that," revealed Cumberbatch at the South Bank Show Awards this afternoon. "All I know at the moment is I'm doing these three [episodes of the upcoming series] and another three." 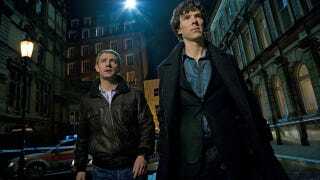 The star added that he would like to see the show continue beyond a fourth series but admitted it would depend on whether he, Freeman and co-creator Steven Moffat could find the time to do it. "It just depends on Martin and I's availability, how long we can keep it going. It depends on Steven's ability. I'd love to keep it going." ALL GLORY TO THE HYPNOTOAD CUMBERBATCH!